"Quite possibly one of the finest, one-off post-punk 7"s ever." One half of B12 talks about his first release in over a decade. Indifferent Dance Centre were one of those groups that seemed to materialise out of thin air only to ‘disappear’ just as quickly as they originally emerged. Comprised of Lizzy Dowling (vocals / lyrics), Christopher Binns (guitar) and brothers Ashley Barrett (bass) and Douglas Barrett (drums / guitar & bass when required) the group came together in Chichester at the outset of the 1980s as likeminded friends, all characterised by a self-contained resolve, a thorough lack of pretension and a determination to make a record in the same spirit as their punk / DIY contemporaries, as well as influential predecessors like The Desperate Bicycles. Outcasted in a town that fell outside of more established areas of activity and one that was shaped, at that time, by Thatcherism and Middle England conservatism, they were nevertheless enthused by the encounters they had with punk, cultivating an active appreciation for its many aesthetic dimensions as well as harbouring later more specific affinities for the likes of Gang of Four and Joy Division. 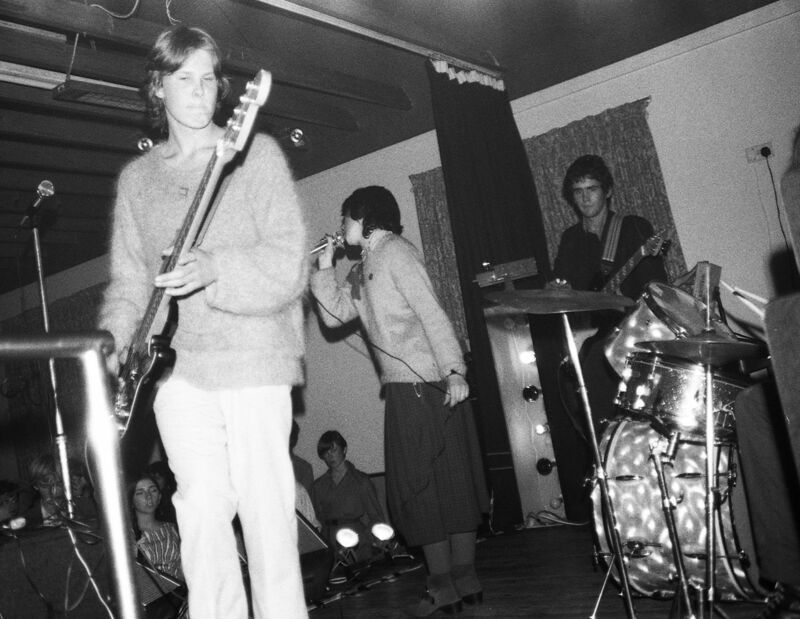 Through the ventures of local peers, out-of-town gigs, zines and the recommendations of school-friends the group were afforded a fair amount of exposure to punk’s initial detonation and its myriad reverberations, yet they were never close enough to the usual metropolitan focal points to be part of the noise and the hype. Reliably informed but not encumbered by outside influence they developed independently and were in many ways compelled to, given the dearth of interest in bands from Chichester at the time. Alongside Gang of Four and Joy Division they developed assorted, individual interests in pop, disco, Dadaism, the wider output of Factory Records and Scott Walker, and, encouraged by the autonomous ad-hoc philosophies and glimpses of diversity they perceived in punk and DIY, they set out to capture their own contribution to the subculture that had inspired them. The outcome was ‘Flight & Pursuit’, a record that they pressed up 500 copies off to sell at a CND gig a few weeks later. In the aftermath of the release IDC courted interest from Cherry Red, re-recorded an updated (though now lost) version of the single and ended up appearing on a bill with The Passage. Most of the group – apart from Ashley – moved to Manchester and started enjoying the city and its nightlife, going on regular outings to the Hacienda. As a result, the group became divided by circumstance and they each went their separate ways, eventually starting new lives and families away from IDC and their other formative endeavours. Still, with only the one record to their name, IDC left a potent legacy that endures. With ‘Flight & Pursuit’ they fashioned an immaculate work of introverted, mesmeric post-punk suffused with the kind of stately delicacy only ever found in the superior material of the Marine Girls and the Young Marble Giants; qualities that, in the manner of IDC’s execution, feel entwined with a more fiercely guided, brooding and dubwise impetus. ‘Flight & Pursuit’ initially slipped under the radar yet has since become a hallowed curiosity, accruing a reputation that the group always deserved. Although a product of momentary inspiration made by a peripheral group with limited resources, it’s quite possibly one of the finest, one-off post-punk 7”s ever. In the wake of the record’s rerelease – lovingly reissued by ‘our lot’ aka Outer Reaches – we discussed the story of ‘Flight & Pursuit’ and IDC with two of its creators, Lizzy Dowling and Douglas Barrett. In their answers they reveal a group shaped by a guileless enthusiasm for art and music and, as Lizzy relates, a record that is merely part of ‘a wider shared history’. Can you trace the beginnings and who the respective members of Indifferent Dance Centre were? How did you all meet and how did you end up forming the group? What were your individual tastes like and how did they come together in IDC? LD: We met at school and college via friends. In the mid to late 70s, music tended to define your friendship group and we were no different to our peer group in this respect. Forming a group was again something that you just did at this point. All our friends were in groups. We were lucky that we were able to put on live shows as Mark White and Eddie Riff...both a few years older than us...put on monthly gigs and organised band nights in a local community centre. It was through this that we also met other bands etc. We mostly liked the same music at this point. I loved the fashion and attitude of punk and also the fact that women were part of it...it never felt like something girls weren’t a part of...which some of the mid 70s progressive rock music did...music that was big in the boys school 6th form. Before punk I liked pop and what used to be called “disco”. Once the initial creativity of the first punk groups passed we were massively into Joy Division, Factory, Gang of Four etc. Chris had quite eclectic tastes and introduced me to The Doors and Scott Walker. DB: Obviously Ashley and I grew up together as brothers. I think we met Lizzy in the final year at high school, she then met Christopher at college. Chichester Roc Society was the focal point on Saturday night for us, Mark and Ed would squeeze in as much punk as they dared. Buzzcocks, Mekons, Gang of Four and obviously lots of the usual Factory stuff.